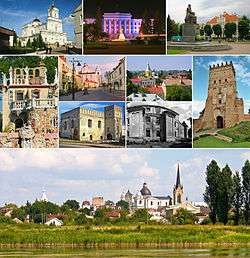 Lutsk is an ancient Slavic town, mentioned in the Hypatian Chronicle as Luchesk in the records of 1085. The etymology of the name is unclear. There are three hypotheses: either the name may have been derived from the old-Slavic word luka (an arc or bend in a river), or the name may have originated from Luka (the chieftain of the Dulebs), an ancient Slavic tribe living in this area. The name may have also been derived from Luchanii (Luchans), an ancient branch of the tribe mentioned above. Its historical name in Ukrainian is Луцьк; in Russian, Луцк; and in Polish, Łuck; in Yiddish, Loytsk. According to legend Luchesk dates from the 7th century. The first known documentary reference dates from the year 1085. 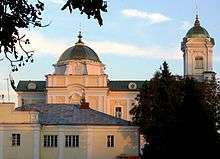 The town served as the capital of Halych-Volynia until the foundation of Volodymyr-Volynsky. The town was established around a wooden stronghold built by a local branch of the Rurik Dynasty. At certain times the location functioned as the capital of the duchy, but since there was no need for a fixed capital in medieval Europe, the town did not become an important centre of commerce or culture. 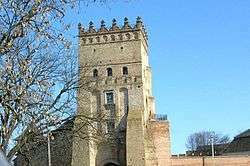 In 1240 Tatars seized and looted the nearby town but left the castle unharmed. In 1321 George son of Lev, the last of the line, died in a battle with the forces of Gediminas, Grand Duke of Lithuania, and Lithuanian forces seized the castle. In 1349 the forces of Casimir III captured the town, but Lithuania soon retook it. The town began to prosper during the period of Lithuanian rule. Prince Lubart (died 1384), son of Gediminas, erected Lubart's Castle as part of his fortification programme. Vytautas the Great founded the town itself by importing colonists (mostly Jews, Tatars, and Karaims). In 1427 he transferred the Catholic bishopric from Volodymyr-Volynskyi to Luchesk. Vytautas was the last monarch to use the title of "Duke of Volhynia" and to reside in Lubart's Castle. The town grew rapidly, and by the end of the 15th century there were 19 Orthodox and two Catholic churches. It was the seat of two Christian bishops, one Catholic and one Orthodox. Because of that the town was sometimes nicknamed the Volhynian Rome. The cross symbol of Lutsk is featured on the highest Lithuanian Presidential award, the Order of Vytautas the Great. In 1429 Lutsk was the meeting place selected for a conference of monarchs hosted by Jogaila and Sophia of Halshany to deal with the Tartar threat. Among those invited were Sigismund, Holy Roman Emperor, Vasili II of Russia, the king of Denmark Eric of Pomerania, Grand Master of the Livonian Order Zisse von Rutenberg, Duke of Szczecin Kazimierz V, Dan II the Hospodar of Wallachia and Prince-electors of most of the countries of Germany. In 1432 Volhynia became a fief of the Crown of the Kingdom of Poland and Lutsk became the seat of the governors, and later the Marshalls of the Land of Volhynia. That same year, the city was granted Magdeburg rights. In 1569 Volhynia was fully incorporated into the Polish kingdom and the town became the capital of the Volhynian Voivodeship and the Łuck powiat (Polish administrative unit). After the Union of Lublin the local Orthodox bishop converted to Greek-Catholicism. The town continued to prosper as an important economic centre of the region. By the mid-17th century Łuck had approximately 50,000 inhabitants and was one of the largest towns in the area. During the Khmelnytskyi Uprising the town was seized by the forces of Colonel Kolodko. Up to 4,000 people were slaughtered, approximately 35,000 fled, and the town was looted and partially burnt. It never fully recovered. In 1781 the city was struck by a fire which destroyed 440 houses, both cathedrals, and several other churches. In 1795, as a result of Partitions of Poland, the Russian Empire annexed Lutsk. 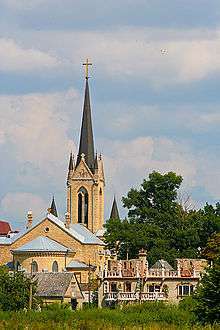 The Voivodeship was liquidated and the town lost its significance as the capital of the province (which was moved to Zhytomyr). After the November Uprising (1830–1831) efforts increased to remove Polish influence and Russian became the dominant language in official circles, though the population continued to speak Ukrainian, the Polish population Polish, and the Jewish population Yiddish, if only in private circles. 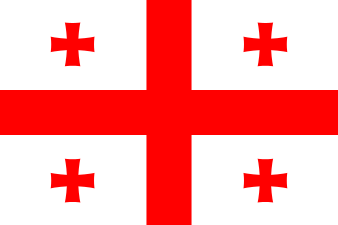 The Greek Catholic churches were turned into Orthodox Christian ones, which led to the self-liquidation of the Uniates here. In 1845 another great fire struck the city, resulting in a further depopulation. In 1850 three major forts were built around Lutsk, and the town became a small fortress called Mikhailogorod. During the First World War the town was seized by Austria-Hungary on August 29, 1915. The town sustained a small amount of damage. During more than a year of Austro-Hungarian occupation Lutsk became an important military centre with the headquarters of the IV Army under Archduke Josef Ferdinand stationed there. A plague of epidemic typhus decimated the city's inhabitants. On June 4, 1916 four Russian armies under general Aleksei Brusilov started what later became known as the Brusilov Offensive. After up to three days of heavy artillery barrage, the Battle of Lutsk began. On June 7, 1916 the Russian forces reconquered the city. After the signing of the Treaty of Brest-Litovsk in 1917, the city was seized by Germany on February 7, 1918. On February 22, 1918 the town was transferred by the withdrawing German army to the forces loyal to Symon Petlura. During the Polish-Bolshevik War, on May 16, 1919 Lutsk was taken over by the forces of Poland's Blue Army after a heavy battle with the Red Army. The city was devastated and largely depopulated. It witnessed the Soviet counter-offensive of 1920 and was taken on 12 July 1920. It was recaptured by Poland's 45th Rifles regiment and field artillery on September 15, 1920. According to American sociologist Alexander Gella "the Polish victory [over the Red Army] had gained twenty years of independence not only for Poland, but at least for an entire central part of Europe. 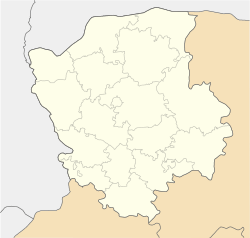 Łuck was designated by the newly-reborn nation of Poland as the capital of the Wołyń Voivodeship. The city was connected by railroad to Lviv (then Lwów) and Przemyśl. Several brand new factories were built both in Łuck and on its outskirts producing farming equipment, wood, and leather products among other consumer goods. New mills and breweries opened. An orphanage was built, and a big new bursary. The first high-school was soon inaugurated. In 1937, an airport was established in Łuck with an area of 69 hectares (170 acres). The 13th Kresowy Light Artillery Regiment was stationed in the city, together with a Łuck National Defense (Poland) Battalion. In 1938, construction of a large modern radio transmitter began in the city (see Polish Radio Łuck). As of January 1, 1939 Łuck had 39,000 inhabitants (approximately 17,500 Jews and 13,500 Poles). The powiat formed around the town had 316,970 inhabitants, including 59% Ukrainians, 19.5% Poles, 14% Jews and approximately 23,000 Czechs and Germans. On Thursday, September 7, 1939 at app. 5 p.m., Polish government, which had left Warsaw the day before, arrived at Łuck. German intelligence quickly found out about it, and the city was twice bombed by the Luftwaffe: on Sept. 11, and Sept. 14. After panzer units of the Wehrmacht had crossed the Bug river, on September 14, the government of Poland left Łuck and headed southwards, to Kosow Huculski, which at that time was located near the Polish - Romanian border. As a result of the Invasion of Poland from both sides and the Molotov-Ribbentrop Pact, Łuck, along with the rest of western Volyn, was annexed by the Soviet Union. Most of the factories (including the almost-finished radio station) were dismantled and sent east to Russia. Approximately 10,000 of the city's Polish inhabitants (chiefly ethnic Poles, but also Polish Jews) were deported in cattle trucks to Kazakhstan and 1,550 were arrested by the NKVD. After the start of Operation Barbarossa the city was captured by the Wehrmacht on 25 June 1941, but not before thousands of Polish and Ukrainian prisoners were shot by the retreating NKVD responsible for political prisons. The inmates were offered amnesty and in the morning of 000000001941-06-23-0000June 23 ordered to exit the building en masse. They were gunned down from Soviet tanks. Some 4,000 captives including Poles, Jews and Ukrainians were massacred. Upon Nazi occupation most of the Jewish inhabitants of the city were forced into a new Łuck Ghetto (German: Ghetto Luzk) and then murdered at the execution site on Górka Połonka hill not far from the city. In total, more than 25,000 Jews were executed there at point-blank range, men, women and children. The Łuck Ghetto was liquidated entirely through the Holocaust by bullets. During the massacres of Poles in Volhynia approximately 10,000 Poles were murdered by the Ukrainian Insurgent Army in the area. It was liberated by Red Army on 2 February 1944. Following the end of the war the remaining Polish inhabitants of the city were expelled, mostly to the areas sometimes referred to as the Polish Regained Territories. The city became an industrial centre in the Ukrainian SSR. The major changes in the city's demographics had the final result that by the end of the war the city was almost entirely Ukrainian. During the Cold War, the city was home to Lutsk air base. As one of the largest cities in Western Ukraine, Lutsk became the seat of a General Consulate of Poland in 2003. Lutsk is an important centre of industry. 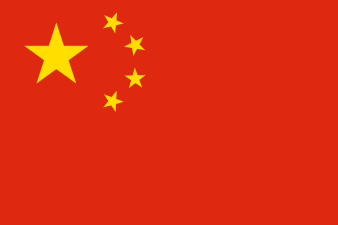 Factories producing cars, shoes, bearings, furniture, machines and electronics, as well as weaveries, steel mills and a chemical plant are located in the area. Modern-Expo Group - one of the largest manufacturers and suppliers of equipment (metal shelving, high racks systems, checkouts, catering equipment, refrigeration equipment, POS-equipment and guidance systems) for retail and warehouse use in Central and Eastern Europe. Lutsk compact overhead powerline, a powerline of unusual type. One of the longest buildings in the world: Apartment house on Sobornosti av. and Molodyozhi st. (50.761219°N 25.368719°E) Length: 1750 m.
The NKVD and Nazi massacres are mentioned in the Prix Goncourt awarded novel The Kindly Ones by Jonathan Littell. 1 2 "Чисельність наявного населення України (Actual population of Ukraine)" (PDF) (in Ukrainian). State Statistics Service of Ukraine. Retrieved 1 July 2016. 1 2 Antoni Tomczyk (2013). "Łuck - Miasto bliskie sercom naszym". Kresowe Stanice. Stowarzyszenie Rodzin Osadników Wojskowych i Cywilnych Kresów Wschodnich. Retrieved 2013-06-18. ↑ Aleksander Gella (1988), Development of Class Structure in Eastern Europe: Poland and Her Southern Neighbors, SUNY Press, ISBN 978-0-88706-833-1, Google Print, p. 23. ↑ Tadeusz Piotrowski (1998), Poland's Holocaust (Google Books). Jefferson: McFarland, pp. 17-18, 420. ISBN 0-7864-0371-3. ↑ Feliks Trusiewicz, Zbrodnie – Ludobójstwo dokonane na ludności polskiej w powiecie Łuck, woj. wołyńskie, w latach 1939-1944. (War crimes committed against Polish nationals in the Łuck county, 1939–44). Retrieved July 22, 2015. ↑ Berkhoff, Karel Cornelis (2004). Harvest of Despair. Harvard University Press via Google Books. p. 14. ISBN 0674020782. Retrieved July 22, 2015. ↑ Piotrowski 1998, p. 17. ↑ YIVO Encyclopedia of Jews in Eastern Europe, Lutsk. Ghetto history. Retrieved 22 July 2015. ↑ "The Holocaust by bullets" by National Geographic Channel on YouTube Retrieved 20 July 2015. ↑ "Luck (Lutsk) Climate Normals 1961-1990". National Oceanic and Atmospheric Administration. Retrieved September 29, 2016. ↑ "Miasta bliźniacze Torunia" [Toruń's twin towns]. Urząd Miasta Torunia [City of Toruń Council] (in Polish). Retrieved 2013-08-22. ↑ "Miasta partnerskie - Zamość". Urząd Miasta Zamość (in Polish). Retrieved 2013-07-26. 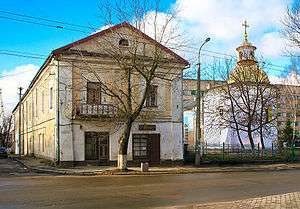 Wikimedia Commons has media related to Lutsk. 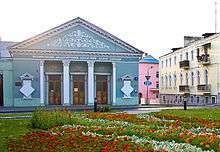 Wikivoyage has a travel guide for Lutsk. 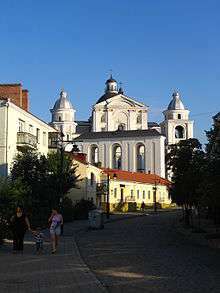 Look up lutsk in Wiktionary, the free dictionary. Wikisource has the text of the 1921 Collier's Encyclopedia article Lutzk.